PHILADELPHIA, PA--(Marketwired - Oct 11, 2013) - At the 2013 IACP Conference in Philadelphia, W. L. Gore & Associates, Inc., will introduce two additions to its line of GORE® Advanced Products for Law Enforcement. This line of products is engineered specifically for officers who need lightweight gear that is comfortable inside the car and protects from the elements when outside. The WINDSTOPPER® lightweight loft duty jacket and WINDSTOPPER® performance base layer are the latest products designed to deliver added warmth in regions with cold and windy weather. At the same time, the breathable construction of the WINDSTOPPER® fabric allows perspiration to escape, so you do not get overheated when inside or during highly active operations outside. For those conditions when the weather can be cold and/or windy, the WINDSTOPPER® lightweight loft duty jacket is ideal when you are on patrol or securing an accident scene. Its durable water-resistant fabric also protects against light precipitation, including short rain bursts, snow, and sleet. The quiet, lightweight construction of this jacket enables you to move easily and focus on your job, not the weather. The breathable WINDSTOPPER® performance base layer is a unique, thin base layer specifically designed for law enforcement. 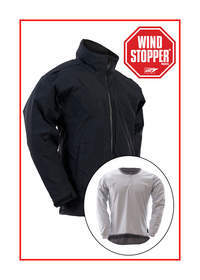 It features the durable WINDSTOPPER® fabric that helps protect your body's microclimate against the chilling effects of the wind and helps regulate body temperature. Its smooth, snag-free outer surface makes it easy to don/doff your uniform and does not restrict your range of motion while on the job. Its thin construction reduces noise that can attract unwanted attention, while providing extra warmth in cold, windy conditions. The combination of highly breathable and wicking technologies keeps you warm and dry, enabling you to wear the WINDSTOPPER® performance base layer for an entire shift. According to Steve Lampo, Gore's North American product manager for law enforcement duty outerwear, their development team continues to draw on the information they gathered while riding along with officers in different parts of the country. "Law enforcement professionals must respond to calls even in cold and windy conditions, and they must be able to focus on the operations around them, not the weather. These additions to our line of GORE® Advanced Products for Law Enforcement are just the latest in our on-going development of gear that officers can put on and keep on for an entire shift." For more information about the complete line of GORE® Advanced Products for Law Enforcement, stop by Gore's booth #2215 at IACP 2013, visit www.GoreProtectiveFabrics.com/PatrolOfficers, or call 800.431.GORE (4673). To purchase garments from this line, visit www.FORUM-DIRECT.com. The WINDSTOPPER® lightweight loft duty jacket and WINDSTOPPER® performance base layer deliver added warmth in regions with cold and windy weather.